Community life is central to the lives of people in Vanuatu. 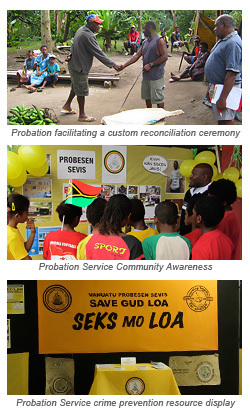 The Probation Service works with communities to manage offenders in their own communities. Parole - detainees who are released from custody serve a minimum of 12 months on parole. Their parole includes regular monitoring and adherence to conditions set down by the Community Parole Board. If these conditions are not followed, the offender can be recalled to a Correctional Centre. In addition to sentence management the Probation Service are also responsible for the provision of pre-sentence reports to the Court and for writing pre-release reports for the Community Parole Board. Community Justice Supervisors are at the heart of the Department's work. They are of high standing in their communities (usually chiefs, pastors or community leaders) and they volunteer their time to manage offenders with the support of Probation Officers. As a Department we believe that these sorts of partnerships with communities are the best and most efficient way to support the development of safer and more harmonious communities in Vanuatu.